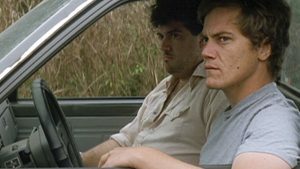 Jeff Nichols’ award-winning directorial debut Shotgun Stories is a flawless film. This quality is a crucial distinction to make in discussing a film as part of my continuing “On theFringe” series, as this factor sets the movie apart from its (predecessor) compatriot pictures in my compendium. Up until now, the films analyzed have been for the most part appropriately sloppy, at times meandering, nearly expressionistic in their approach toward reality beyond what is portrayed onscreen. As mentioned in an earlier installment, the vast majority of the movies chronicled in this series have a certain affinity with the Cuban productions of the late mid-century “Imperfect Cinema” movement. They are films that are not only about rougher, more brutal realities of the genuine American experience but – On the Bowery, Killer of Sheep and The Exiles being exemplars here – were made under nearly impossible conditions that generated films exhibiting such necessary meta-truth. These were beyond low-budget productions, beyond the reach of modern resources. There are those films in my series that could not even find a true distribution/release until two or three decades later, due to lack of such resources/funding. Make no mistake: These are all innovative, creative, groundbreaking and essential films. Hence the work and time being put in here by myself and my dedicated editor who has so graciously allowed me to wax poetic on these ten movies that insightfully explore the genuine American experience of those who too often are left elided by even the soi-disant “indie” movie scene. 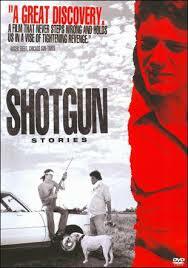 Nichols’ Shotgun Stories is something different altogether. It too is inarguably innovative, creative and groundbreaking. It too, as with its sister films in this series, is plainly and simply a prime representation of resourceful filmmaking at its very best. It just happens to also be masterfully slick and clean in its spectacular cinematography (with each shot ideally constructed). Its script – in story arc, structure and dialogue – is unwavering in its organic authenticity, while remaining fully engaging and at times exhilarating. Its luminous score – by Nichols’ own brother – is used sparingly but to optimal emotional effect, granting at times an almost dreamlike quality to the otherwise muddy realities of the story/stories unfolding onscreen. Most noticeably, of course, is the perfection to behold in casting, performances and acting direction, whether in regard to prominent breakout roles for the likes of a young Michael Shannon – arguably the greatest living American actor – or those actors and performances establishing the wrong-side-of-the-tracks, rundown Arkansas smalltown environs onto which Nichols so astutely focuses his lens. Shannon is basically the surrogate paterfamilias of his trio of brothers – his two younger siblings being “fully grown” in appearance and age only; both look to him for advice on everything from whether or not to get a summer job, to whether or not they should get married; and both are homeless, with one sleeping in a tent outside Shannon’s sub-modest house, and the other quite literally living in a van down by the river. Their estranged father has passed away, they’re informed by their plain-faced, broken-down mother knocking at Shannon’s door while the other two are camping out at his house, thanks to Shannon’s wife having left to the other side of town to stay with her mother after Shannon refused to stop gambling (“It’s not gambling,” he says over and over again to anyone who will listen; “It’s a system”). There’s almost no cloying emotionality in the exchange at the door – the boys’ mother may as well have told them she just saw a big sale down at the local grocery store, as we get the immediate sense that just as Father was not a part of the three brothers’ lives, neither was Mom. She leaves, and the three young men make their way later in the week to Dad’s funeral (which Mom has told them she will not be attending). Words are exchanged at the funeral – at which Shannon and his two brothers are clearly not welcome by the new family their father had cultivated after abandoning them – and the plot of the film sparks here, after Shannon makes an incendiary statement about his father that none of those present would be able to forget, spitting on Dad’s coffin for full effect before an outright fight breaks out and a cross-family war in this tiny Arkansas town is declared. But this blood feud between half-brothers – Shannon and his two siblings and the Hayes Brothers from Dad’s second marriage – is only one small part of the larger compact universe of Shotgun Stories, which is more of a modern Southern Gothic anthology (a la Flannery O’Connor) involving Shannon’s youngest brother, Kid, facing that dilemma of whether or not he should marry his girlfriend; their middle brother Boy trying his darndest to get an air-conditioning window unit he found to work in his barely running van (or anywhere else); and Shannon’s character Son trying to win back the affection of his runaway wife and mother of his son Carter while continuing to perfect his “system” of card-counting to make a better life for himself, his wife and his son than what he can provide through his paltry $20,000-a-year fishing job. Other minor characters have their own uniquely simple problems to deal with, such as young Shampoo, a local friend who just wants to be able to find a spot at which he can park his car – preferably on Son’s property – where he won’t have to pay a fee or get it vandalized (a problem that arises with Boy’s van). Even the Hayes Brothers have their own difficulties with money, work, drinking, feuding and – throughout the entire course of the film – repairing a recalcitrant tractor. There is an unquestionable degree of reality with which Nichols – born and bred in Shotgun Stories’ Arkansas, an environment that has become his signature area of interest, a la Woody Allen’s Manhattan, John Waters’ Baltimore and Alexander Payne’s Omaha – imbues the entirety of his humble and simple-seeming, at times dark and disturbing film. There are those critics who found the movie slow and far too hypnotically meditative – with whole scenes devoted to figuring out which bobbers to use while fishing, or getting a broken VCR to work. But what makes Shotgun Stories so special for viewers patient enough to enjoy fully what it has to offer is this quotidian reality structured in a matrix of beautifully rendered, at times almost painterly images, punctuated by the film’s emotionally-resonant-without-being-distracting minimalist score. This is a matter of Nichols taking the lessons learned from fellow recent filmmakers of the nineties – described in my piece on Allison Anders’ Gas, Food Lodging – in making a clean, artistic “indie” film … while at the same time ensuring there remains a brutally real truth throughout, a la much earlier films in this series such as Killer of Sheep and The Exiles. Shotgun Stories is then flawless not only because of its timeliness, its genuine portraiture of a certain place and era, a certain community of marginalized persons rarely seen onscreen … but also because it is so incredibly well composed at the same time. It’s a perfect combination of brutal, messy reality as exhibited by the films of the mid-century on my “On The Fringe” list – and those of the later nineties “indie” era vying to bring in mainstream appeal and more technical craftsmanship. It is what makes Nichols such a master filmmaker, and his debut film so admirably watchable (for multiple viewings). It is what makes Shotgun Stories a paragon of similar films released around this time that combined brutal truth with optimal craftsmanship and accessibility in the likes of Tod Williams’ The Adventures of Sebastian Cole, Jeff Lipsky’s Flannel Pajamas, Tamara Jenkins’ Slums of Beverly Hills, Michael Kang’s The Motel (which in some ways presaged Sean Baker’s recent The Florida Project), Debra Granik’s Winter’s Bone, the early works of David Gordon Green (namely his breathtaking debut George Washington; it should be noted he unsurprisingly produced Shotgun Stories), as well as the wildly prolific Brit Michael Winterbottom (particularly 9 Songs, a combination of a masterfully crafted mainstream romantic drama … and erotica involving actual penetration as well as documentary sequences involving actual concert footage), and of course a film that nearly made my list on its own, Marc Forster’s Monster’s Ball. Even in the most mainstream of fare at this time – cartoons on television – we saw a terrific outpouring of series that were able to combine radically specific elements of the genuine American experience with as accessible and easily entertaining craftsmanship in such prime examples as Mike Judge’s King of the Hill, Aaron McGruder’s The Boondocks and Trey Parker/Matt Stone’s South Park. As fun and watchable and professionally well-made these projects could be, there was always a reminder of reality – again, even in the cartoons mentioned – that made them so enduring and blissfully universal in scope of subject. Mummerset being a British pejorative mocking the fake, caricatured accent given to characters in books and, later, TV shows and movies that sound to the untrained ear and uninitiated as “real” when in fact anyone who actually lives in the smaller villages and towns in which Mummerset as a dialect was employed in books or onscreen would know no one actually talks that way. Billy Bob Thornton had a similar complaint about characters he so often had to play as background or minor characters in films that forced him into using his own kind of Mummerset, or as he put it once in an interview, a way of talking to make him sound like he was from Arkansas, even though there is no kind of Arkansas accent like that. Thornton is another Arkansas native who would become so frustrated with Mummerset and the un-reality of the roles and films he was in to pay the bills that he eventually came to figure out a way to make his own award-winning short that would showcase a beautiful and poignant story of real people living in the real hinterlands of Arkansas called Some Folks Call It a Sling Blade, before adapting the short to a feature film – Sling Blade – and kickstarting what would become a massive career for himself throughout the early 2000s as both filmmaker and continued actor. While all of this was going on, we had a burst of the most truthful independent spirit in American film since the late sixties/seventies with what some journalists chose to categorize as “mumblecore,” a completely grassroots, bare bones, Cassavetes-inspired filmmaking style that much of the time appeared almost cinéma vérité and would almost always tell the story of young twenty-somethings on the fringe trying to figure out what the hell to do with their lives and which would similarly kickstart the careers of the likes of (unwitting) originator of the scene Andrew Bujalski, Joe Swanberg, Greta Gerwig, Lynn Shelton, Alex Ross Perry and the extremely prolific Duplass Brothers, with such admirable, memorable films as The Puffy Chair, Hannah Takes the Stairs, Mutual Appreciation, The Color Wheel and Humpday. We would see this brand of absolutely plain, unfettered realism take off in the upcoming years after Shotgun Stories with another significant movement in American film that some have referred to as “pure cinema,” with such wonderful projects as Kelly Reichardt’s 2008 Michelle Williams’ starrer Wendy and Lucy, on the docket for this series next week.